During remarks titled “High Frequency Trading — What is it, and How Does it Impact the Markets” offered at CUA Law on Oct. 29, a senior SEC official explained that the integrated nature of the computer systems that drive equity trading today makes it difficult to regulate just one aspect of it. Berman, Gregg, "High Frequency Trading: What is it, and How Does it Impact the Markets" (2014). 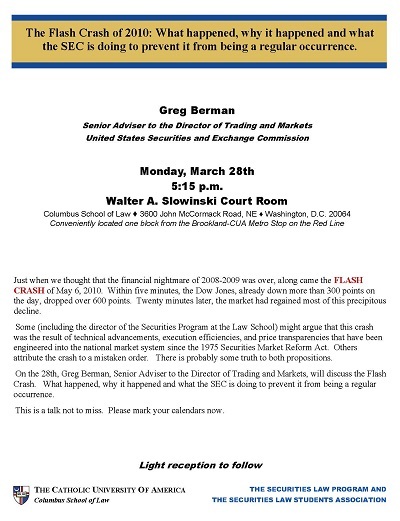 Securities Law Program Lecture Series. 9.